The conference will take place at the historical campus - Department of Mathematics and Statistics, which is situated on the Faculty of Science on Kotlářská 2, (have a look at the map). Lecture rooms equipment: data projector & computer, visualizer, whiteboard or blackboard. Josef Taufer Student Dormitory (Jana Babaka 3/5, Brno) is regularly used as a commercial hotel during school vacations and it offers apartments with two double rooms sharing one bath and a kitchenette. The participants may book either a bed in a double room or a whole double room as a single room. There are special prices for the conference participants - a single room with breakfast costs 4.500 CZK per a block of 6 nights, a bed in a double room with breakfast costs 2.250 CZK per a block of 6 nights. The hostel accommodation cost is payable together with the conference fee. Continental Hotel (*** category), Kounicova 6, Brno. It is situated in the centre of the town with easy access from the train/bus stations and 10 minutes walking distance to the conference site. There are special prices for the conference participants - a single room with breakfast costs 1250 CZK per night, a double room with breakfasts costs 1680 CZK per night. Due to the well known and higly visited motorcycling event GrandPrix we cannot keep the low price for the last night (Friday, August 23 - Saturday, August 24). This night will be 3.100 CZK for a single room and 3.380 CZK for a double room. a)	We recommend to take bus Sml AE (tickets can be bought from the driver) to the main station and then direct train to Brno. Alternatively, one can use ordinary city transport (two changes: bus 119, metro A, metro C) to get to Praha-Holešovice station with better connections to Brno. b) In particular, we recommend direct bus connections of Student Agency company ("yellow buses"): Here is the timetable of their buses from the Prague airport Václava Havla to Brno. a)	There are “Student Agency” buses going directly from Vienna airport to Brno. Again, it is advised to book the ticket in advance from Student Agency. Here is the timetable. b)	Take train or bus to Vienna center and then direct train to Brno, cf. the info on the web. The webpage where you can search a bus or train connection within the Czech Republic and neighbouring countries is the National timetable information system. During day bus 76 goes to the main station. At night bus N89 goes directly almost to the hotel (get off at Česká). Look for the lines 76 and N89 in the timetable . 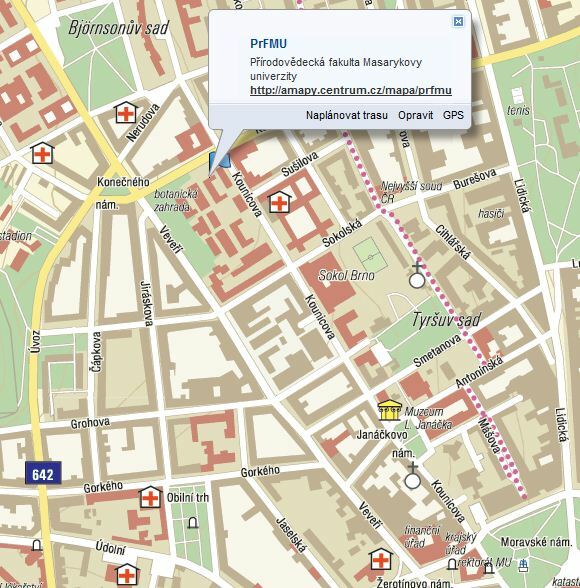 To get to the Hotel Continental from the railway station you can take tram 4 (direction NAMESTI MIRU), tram 12 (direction TECHNOLOGICKY PARK) and get off at Ceska stop. The railway station -> the Josef Taufer Student Hostel: To get to the Josef Taufer Student Dormitory from the railway station you can take tram 12 (direction TECHNOLOGICKY PARK) and get off at Tererova stop. The address of the conference site (this is not a contact address) is Faculty of Science, Masaryk University, Kotlarska 2, CZ-61137 Brno, Czech Republic. The conference place is quite close to both Continental Hotel and Josef Taufer Student Dormitory, approximately 15 min on foot. However, to get there from Hotel Continental you can take trolleybus 32, 34, 36 from Ceska stop and get off at the 2nd Susilova stop. However, to get there from the Josef Taufer Student Dormitory you can take tram 12 from Tererova stop and get off at the 2nd Nerudova stop. See the map including all important places. Founded in the first half of the 13th century as a royal castle for the defence of Brno. After the 17th century it served as a provincial fortress, and in the 18th and 19th centuries it was a prison for political inmates, called the “prison of nations” of the Habsburg monarchy. It is famous e.g. thanks to many Italian Carbonari prisoners. In 1939-1940 it was prison of the Brno Gestapo, and afterwards served as a military building. Since 1960 it has been the central office of the Brno City Museum. There is a permanent exhibit in the castle`s casemates, and a new exhibition named “Spilberk – Prison of Nations”, as well as displays on Brno history and the City Museum gallery, are currently being prepared in the northern wing. The Cathedral of SS. Peter and Paul is located on the hilltop next to the city centre, on the presumed site of the former Brno castle (including a chapel) from the 11th and 12th centuries. After the old castle`s demise a detached Romanesque basilica was rebuilt as a Gothic cathedral in the 13th century, further modified in the 15th and 16th centuries, and converted to the Baroque style in the 18th century. Its current neo-Gothic form dates from the end of the 19th century. Since 1777 the cathedral has been the seat of the Brno bishop. The original church crypt from the 12th century is now accessible to visitors. National Cultural site. Founded in the 13th century. The late gothic building we see today was constructed in the 14th and 15th century. (A. Pilgram, A. Gabri, M. Grim, builders) with its final touches added in the 16th century. Dietrichstein palace was built in the years 1613-16 by G.G.Tencalla. The monumental palace was rebuilt around the year 1720. Part of the building complex is the “bishop’s courtyard” built in 1352. Today’s Moravian Provincial Museum. The Capuchin monastery and the church in the former Coal Market were built by Ondrej Erna in mid-17th Century. It contains a crypt with mummified bodies of the order members and benefactors of the Capuchin Order. Popular recreation area and a perfect place for all kinds of water sports. Banks are lined with sports facilities, restaurants, pubs and stalls. Regular boat service on the route Brno - Veverska Bítýška is open every year from May to September. You can get here from the city center by public transport (tram Nr. 1,3,11tram stop called Přístaviště ). Standing over the Brno reservoir in the Podkomorské woods countryside you can see Veveří castle. This gothic, a former royal hunting castle riddled with myths and legends, is today used as the venue for many cultural and social events. Directly below the castle you can see one of the steamboat stops. More information about the Castle as well as events that take place there can be found on its website. For more information about Brno we refer to the Brno official web or the wikipedia article. Andrei Agrachev, Jian Song and Karsten Grove had to cancel their participation, Valentin Lychagin, Boris Botvinnik and Boris Kruglikov were invited as plenary lecturers. Mini-workshop on applications of sub-Riemannian geometry (in Neuroscience etc.) in the next week after the DGA2013.